Holly Blog: My Favorite Things...78...Quilting Blogs! I was told that I had 2 pages and 750 words to tell my story...Thank goodness they weren't counting, because I managed to squeeze in over a thousand words (but don't tell) and a picture, an anecdote or both on about 20 different quilting bloggers. It wasn't easy, let me tell you; so many choices, and so little space to blather on about my newest blogging friends and my favorite new pastime...I really tried to get a good cross-section of our little quilting community...Designers, sales reps, prolific quilters, etc. PS...I just had to show you this picture, because it cracks me up. I asked someone to take a picture of the prairie points on the Alphabet Soup quilt...If you can guess whose toe-ringed foot that is, you win a prize! HINT: it's NOT my foot! I CANNOT WAIT!! Thanks for including me on the list. And I think the toe migth belong to Jeree??? AHH! I was sure it was her. Hmm. Then I guess Penny. And then I guess I give up, I don't want to just run though everyone in your posse. Thats cheating. i would guess that it's YOUR foot, Holly -- with someone else taking the picture...?! Just sailed by to have a look, got here by using the icon on Lucy's Dutch site. I guess it's Martha Hall's foot :)! I enjoyed visisting your site! This is Martha. It's not my foot! My feet don't look that good! I should have made a guess before. I think that those pretty toes belong to Jean. How exciting! Thanks for including me too Holly! Um, I'm guessing Megan -- 'cause she's the only one I "know" LOL! I think the toes belong to you, Holly. Love the quilt! Thank you so much for including me too... I can't wait to see it !! Thanks for including me! Can't wait to see the magazine. Well, gee. Just what I needed! More lovely blogs to subscribe to. Including yours. Thanks! 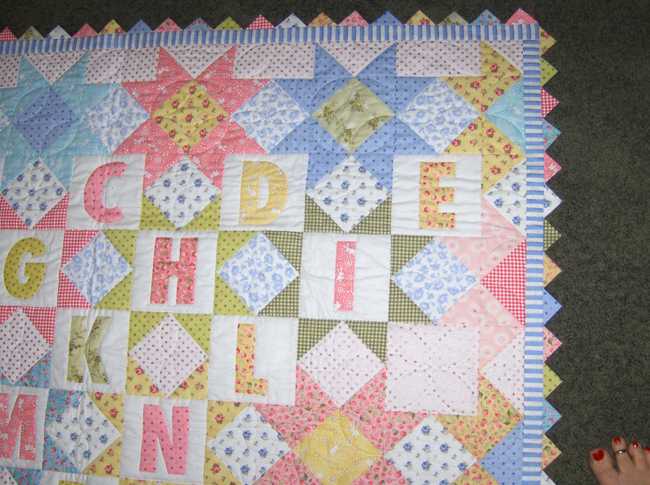 Great quilt and congratulations on the article!! Congrats on your published article... can't wait to read it!! The quilt is adorable! Can't wait for grandchildren to sew and knit and quilt for them. Thw colors are lovely. Oh yes - we all love Bonnie and Lucy!!!!! Congratulations!!! Every first is special... will be waiting for this issue to appear on the shelves! Wonderful job! So cute! Congratulations on your article!! Ok, I'm adding you for sure to my blog!! I want to get back into quilting soon as I get in my new house. Everything is on hold till I can play house again. Your site is so inspiring. Wonderful news about your article. congrats!!!! where do I find the baby girl alphabet. I have gone to several quilt shops in northern Illinois and have checked on line and cannot find it. All contents of this blog are the property of Holly Holderman, and cannot be reproduced in any way without prior written approval.